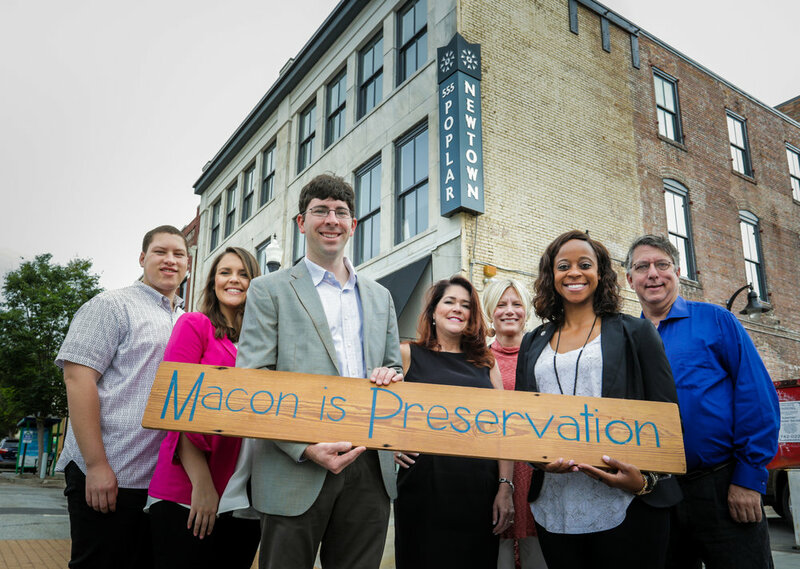 Every May, Historic Macon recognizes outstanding preservation projects with our Annual Preservation Awards. Awards are presented at the annual meeting which is free and open to the public. Nominations are due Thursday, February 28, 2019. Click here to download our nomination form. Or nominate online today! RESIDENTIAL/SINGLE-FAMILY Awards projects of single-family homes that are treated according to the National Park Service's definitions of preservation, rehabilitation, or restoration. COMMERCIAL, INSTITUTIONAL, RENTAL, OR MUNICIPAL Awards commercial, institutional, rental or municipal projects that follow the National Park Service's definitions of preservation, rehabilitation, or restoration. Preservation -places a high premium on the retention of all historic fabric through conservation, maintenance, and repair. It reflects a building's continuum over time, through successive occupancies, and the respectful changes and alteration that are made. Rehabilitation -emphasizes the retention and repair of historic materials, but more latitude is provided for replacement because it is assumed the property is deteriorated prior to work. 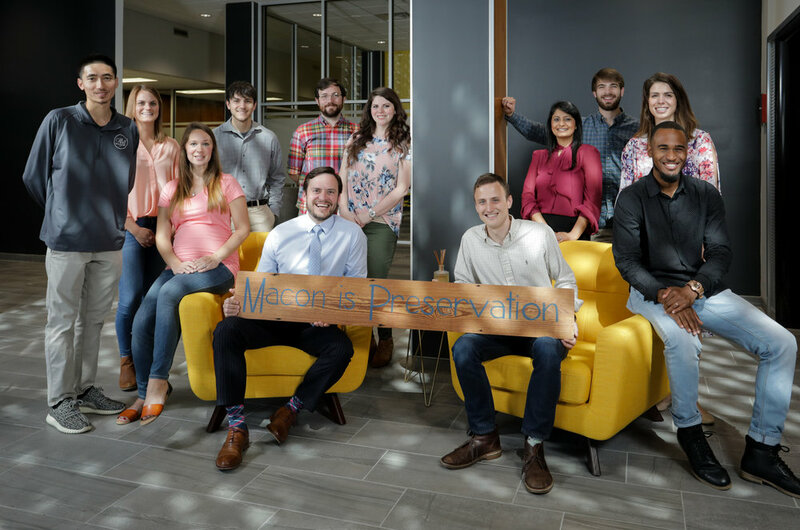 Restoration -focuses on the retention of materials from the most significant time in a property's history, while permitting the removal of materials from other periods. 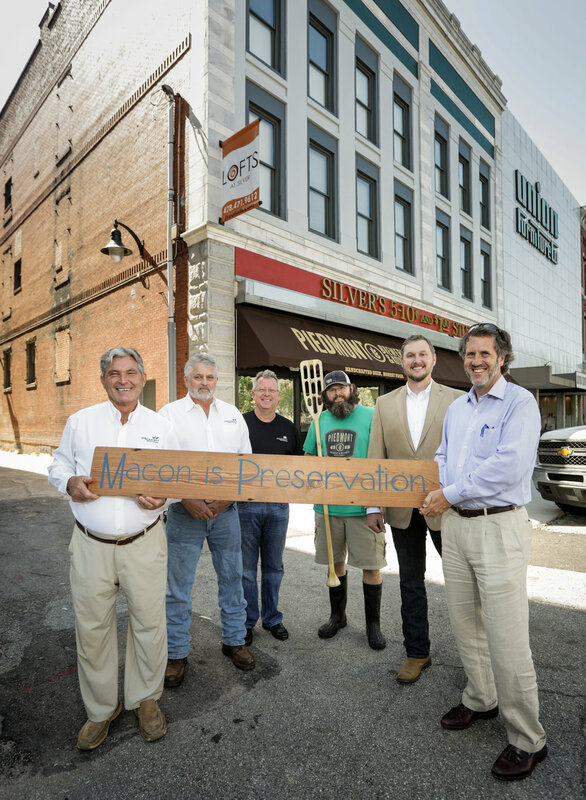 REVITALIZATION AWARD Recognizes a project or work that makes an exception contribution to the community and/or a pioneering investment in historic districts that are in desperate need of revitalization. STEWARDSHIP AWARD Honors owners or caretakers who ensure their buildings stay in excellent condition over a period of decades by consistently maintaining their properties. JENNY THURSTON AWARD Honors an individual for lifetime achievement in the field of historic preservation. MARYEL RAMSAY BATTIN AWARD Honors exceptional contributions to the mission and organization of Historic Macon Foundation over many years. THAD E. MURPHEY PRESIDENT'S CHOICE AWARD Recipient is selected by the chair of Historic Macon's Board of Trustees and honors exceptional contributions to our community. Jimmy Cassidy purchased his home at 546 Arlington Place in 2015 after the previous owner passed away. The property suffered from years of deferred maintenance. Cassidy completed a full exterior and interior rehabilitation that included replacing the roof and siding and repairing windows. Cassidy took advantage of Historic Macon's tax credit consulting service to complete the project. His home is one of many that have been rehabbed on Arlington Place and his work has helped change the landscape of this InTown street. Piedmont Construction purchased and rehabilitated the Silver Building under the leadership of Scott Thompson. Piedmont Construction transformed the second and third stories of the Silver Building into loft apartments and developed the first story as a combination of loft apartments and downtown's newest brewpub, Piedmont Brewery and Kitchen. The original floors were salvaged and installed in public hallways, the beadboard ceiling was restored on the third floor, and an original wooden stairwell was creatively separated from the rest of the building so it could be both fire-rated and preserved. The project used both state and federal tax credits. Piedmont Construction and Geheber Lewis Associates architects in Atlanta designed the exterior and the loft apartments. Frank and Susan Broome have completed four homes in the Huguenin Heights neighborhood. In 2000, the Broomes rehabilitated their home on Coleman Avenue and continued to purchase and rehabilitate properties in the neighborhood. The Broomes currently own four properties on Coleman, Johnson, and Linden Avenues. Three of these properties are rented to vetted tenants who are invested in the Macon community. The couple completes much of the rehabilitation work themselves, such as stripping paint to expose original woodwork. One of their most recent projects, 1259 Linden Avenue, suffered from a fire in May 2016. Despite this setback, they have almost completed this project and plan to make it their new home. Their last two projects, 1262 and 1259 Linden Avenue, utilized both state and federal tax credits. El Camino is located in one of the oldest blocks in downtown Macon. 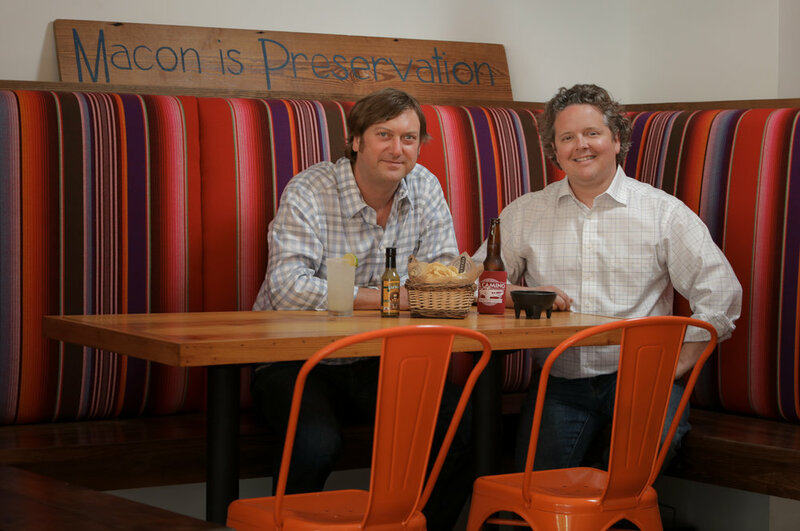 During the taqueria's rehabilitation, Moonhanger Group uncovered the structure's original tin ceiling and prioritized maintaining this original feature. R.C. Poss Construction used special paint to fire-rate the ceiling and carefully placed lighting and ductwork to disturb the ceiling as little as possible. Moonhanger Group is taking advantage of state and federal tax credits for El Camino. BTBB Architects, R.C. Poss Construction, and Robinson Home Interiors completed work on this project. The Jenny Thurston Award is given to individuals for lifetime achievement in the field of historic preservation. 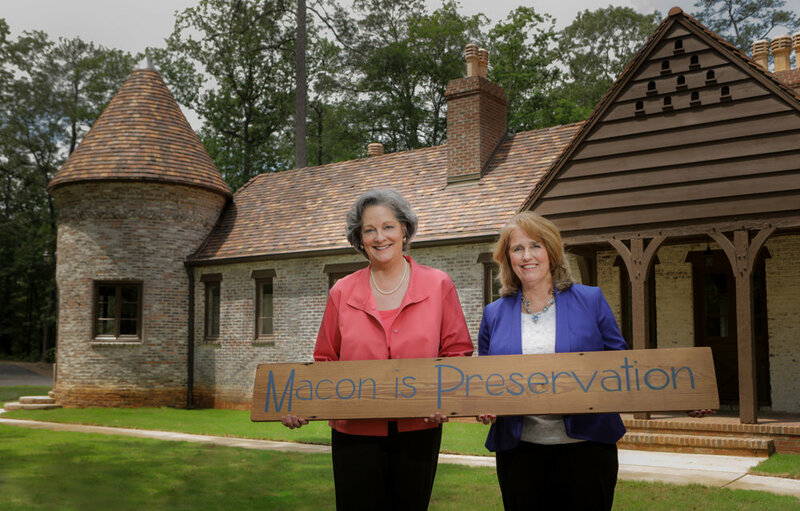 Jim Barfield and Jaime Webb won the award for their years of service to Historic Macon Foundation and its predecessor organizations. 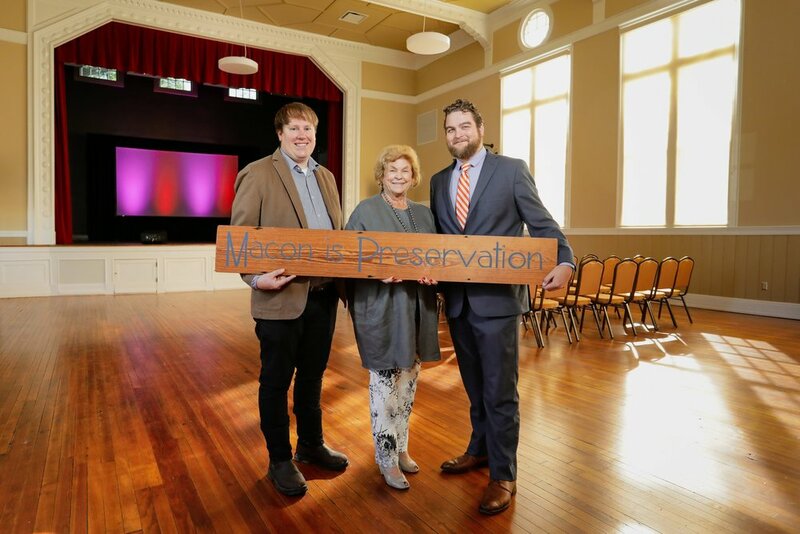 Both men have served in leadership roles in predecessors Middle Georgia Historical Society and Macon Heritage Foundation, and now, Historic Macon Foundation. 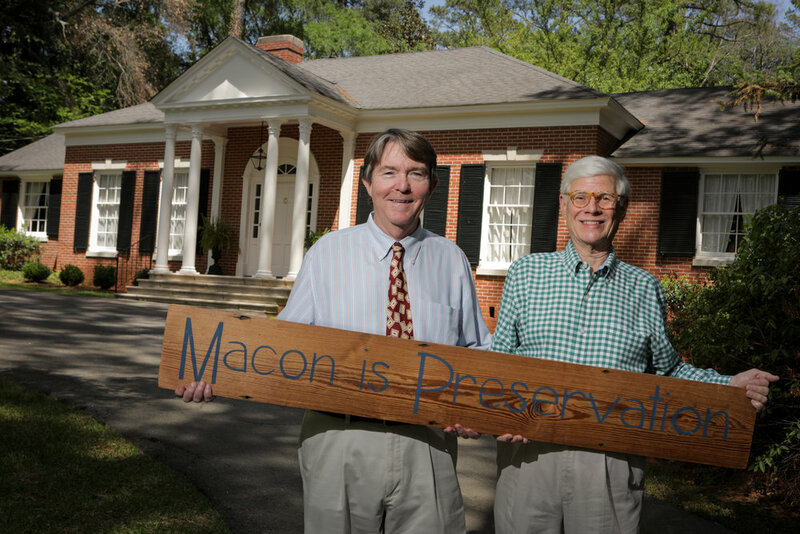 Barfield and Webb are vocal supporters of the preservation movement throughout the state of Georgia and have served the Georgia Trust for Historic Preservation. 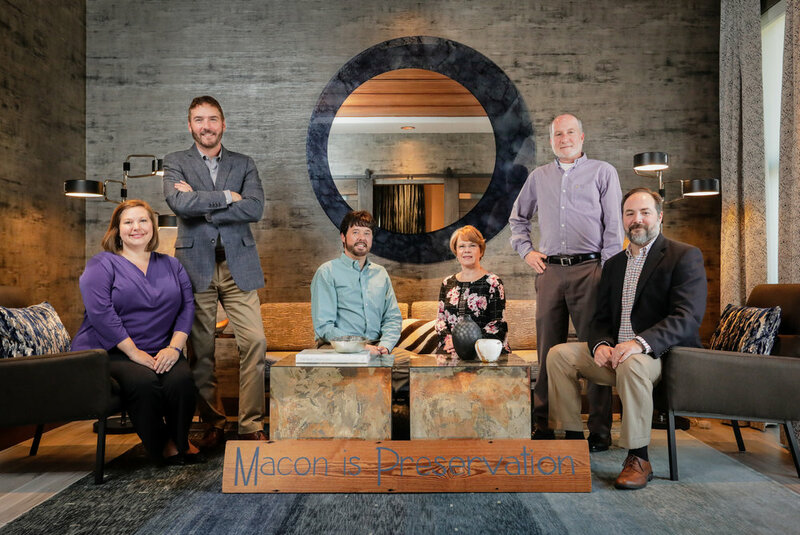 The partners have completed rehabs of numerous historic houses throughout Macon, supported the Friends of Rose Hill, and served on Historic Macon's Board of Trustees and various committees. 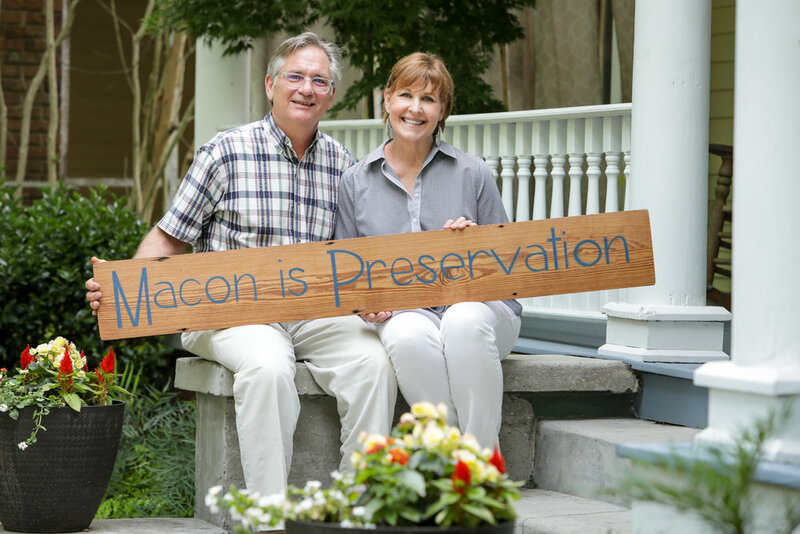 Jim Barfield has led Rose Hill Rambles every spring since 1990 and authored several local history books, and Jaime has served as a realtor for Historic Macon's rehabilitation projects and has closed over 100 historic properties. M&R Marketing Group purchased its downtown location on Third Street after deciding to relocate from North Macon. The marketing firm contemplated removing the building's iconic mid-century grill but ultimately decided to maintain this incredible feature. The completed rehabilitation embraces the mid-century modern aesthetic both inside and out. R.C. Poss Construction completed this project. NewTown converted the former Johnston Brothers Furniture Building into loft apartments as well as its new office and co-working space. The building suffered from a fire in the 1970s and its original parapet was removed later that decade. The revitalization organization added a new parapet to the building, which is based on the historic feature with simpler details in order to avoid a false sense of historical development. The project took advantage of both state and federal tax credits. BTBB, Inc., Piedmont Construction, Robinson Home Interiors, and Michelle Garlington completed the project. Wesleyan College saved the Porter House from demolition by moving it from its original location on Houston Road to the college campus in 2013. The move intially made the Porter House ineligible for historic tax credits was tied to its National Register eligibility. Wesleyan College built a new foundation and fully restored the exterior before the property's eligibility for the National Register and historic tax credits was confirmed. In May 2015, Georgia's Historic Preservation Division officially declared the Porter House of outstanding local significance, make the Porter House eligible for both National Register of Historic Places designation and historic tax credits. Wesleyan College completed the masterful rehabilitation of the Porter House in 2016 with the help of Sheridan Construction. Dunwody, Beeland, and Associates served as the architect for the project, a connection to the designer who originally designed the structure, architect Elliot Dunwody. R.C. Ross Construction moved the house and oversaw the initial phase of rehabilitation. For over 15 years, John Waldvogel has resided and maintained his mid-century home in the Shirley Hills neighborhood. 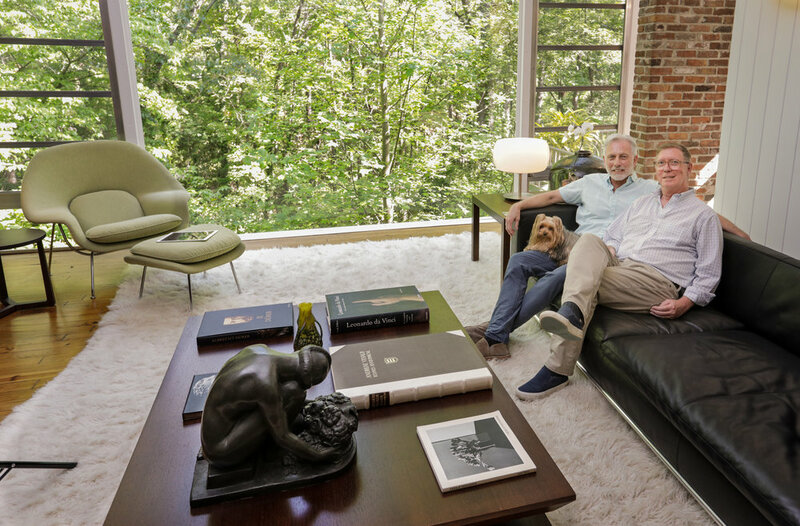 He and his partner, Paul Rogers, painstakingly restored their home, keeping its key mid-century modern features. The landscaping surrounding the property and carefully designed interior show the care and appreciation Waldvogel and Rogers have for their unique home. Rogers is a designer and has also worked on several other mid-century houses in Macon. Richard Paul, lovingly referred to by his North Highlands neighbors as the "lawn fairy," maintains an impeccable yard at 763 Boulevard. 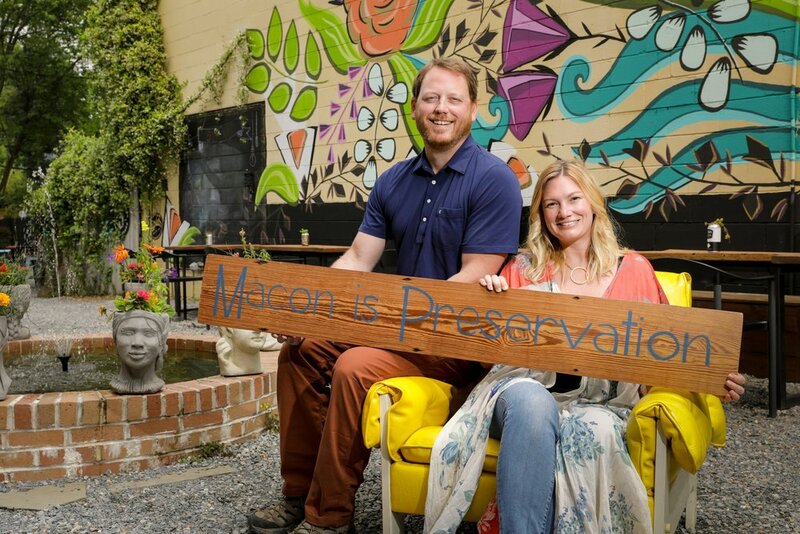 The stewardship of his personal property is notable, but Historic Macon recognized Paul with a preservation award because of his commitment to the beautification of his entire neighborhood. 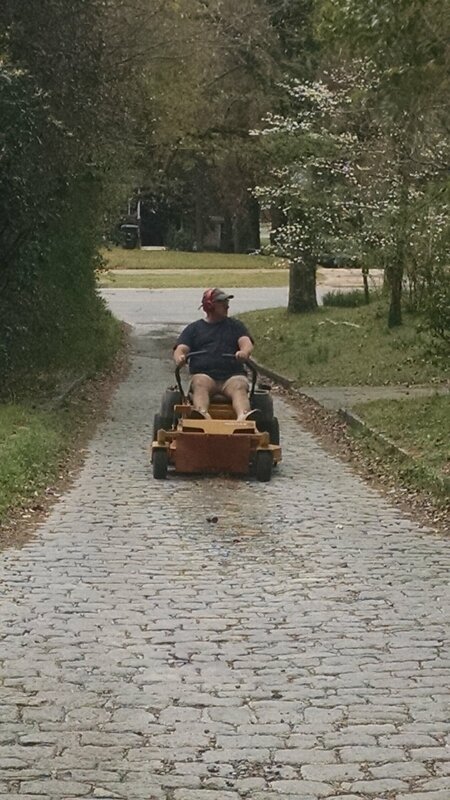 Paul often cuts grass and tends yards for elderly neighbors, absentee landlords, and maintains public spaces, often without thanks or recognition. Rich Bates purchased his Neel Reid home in North Highlands in 1995. Before Bates acquired the house, previous owners converted rooms into offices and it barely resembled Neel Reid's original design. Bates painstakingly brought the house back to its original grandeur, both through its rehabilitation and the recreation of the historic grounds. He actively promotes good stewardship to other owners of Neel Reid designed properties. Bates has taken steps to ensure his home will be preserved for future generations.